This wonderful resort brings a different kind of style to the all-inclusive vacation. Enjoy amazing facilities, a full range of sporting and leisure options, personalized service and gourmet food at the brand new fusion cuisine restaurant Krystal. It features 692 tastefully decorated junior suites with breathtaking views. Guests can "stay at one, play at three" with unlimited access to the New Splash Water World and Riu Pool Party at Riu Santa Fe. 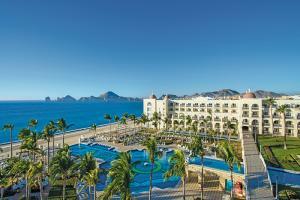 This all inclusive resort is located in the southern Baja California peninsula, 2.7 miles from Cabo San Lucas. Mar de Cortés, Main restaurant; San José, Mexican restaurant; Misaki, Japanese restaurant; Krystal, Fusion restaurant; El Medano, Poolside restaurant/Theme restaurant; Bombay, Indian restaurant. Cabo San Lucas, Golf, Lover's Beach, Arch at Land's End, Deep Sea Fishing, Tennis, Boat Cruises.